With 45 of the top 100, 28 of the top 50, 15 of the top 25 and nine of the top 10 TPI® sires on Holstein Association USA’s Top 100 TPI Bulls list, Select Sires has maintained its position at the top of the industry. 7HO12165 MONTROSS (+2744), new release 7HO12266 YODER (+2673), 7HO11351 SUPERSIRE (+2603), 7HO12105 REFLECTOR (+2590), 7HO12198 KINGBOY (+2567), 7HO11752 BOB (+2564), 7HO11708 ROOKIE (+2555), 7HO11621 MAYFLOWER (+2555) and 7HO11383 MORGAN (+2552) lead the way for Select Sires, and the breed, in the top 10 TPI sires. Additionally, Select Sires leads the industry with the most sires (42) on the Holstein Association USA Top 100 TPI Bulls with 97 percent Rel. for Milk and Type list. Select Sires consistently offers more elite, highly reliable genetics than any other A.I. organization. Of the top 25 proven sires for Net Merit (NM$), 13 are Select sires, as well as 18 of the top 50 and 34 of the top 100. SUPERSIRE is the No. 2 NM$ sire at +866 and is joined at the top of the industry by YODER (+845), MONTROSS (+840), 7HO11985 TETRIS (+812), ROOKIE (+774), 7HO11525 DONATELLO (+750), 7HO11833 RENNIE (+749) and 7HO11395 MYSTIC (+744). In Canada, seven of the top 10 sires for LPI are “7HO” or “250HO” sires including 7HO12111 DRAGONHEART (+3211), 7HO12026 GREENWAY (+3206), 7HO11314 MOGUL (+3201), 250HO1009 BREWMASTER (+3186) and new graduate 250HO12128 THOREAU (+3126). DRAGONHEART is the new breed leader for Pro$ at +2559 while GREENWAY ranks fifth at +2380. There are 13 Select sires among the top 50 active A.I. sires for Milk including the breed leader MONTROSS (+3,063). MAYFLOWER (+2,587), SUPERSIRE (+2,262), TETRIS (+2,178), 7HO11647 POLICE (+2,169) and 7HO11957 TRAYNOR (+2,136) join him at the top of the breed. Select Sires also leads the industry with 14 sires that transmit +1,500 Milk or more and are positive for Daughter Pregnancy Rate (DPR). There are 23 Select sires that transmit more than +120 Combined Fat and Protein (CFP) including the top two active A.I. sires: MONTROSS (+182) and SUPERSIRE (+178). TETRIS (+162), YODER (+153) and 7HO11419 HEADLINER (+143) are among the top 11 in the breed. MONTROSS (+91) and MAYFLOWER (+80) are the top two sires for Protein while SUPERSIRE (+108) is the No. 1 Fat sire and BREWMASTER ranks fourth at +98. Select Sires has designated the highest Wellness Trait Index™ (WT$™) sires, an index that focuses on six wellness traits (mastitis, lameness, metritis, retained placenta, displaced abomasum and ketosis) and includes an economic value for Polled test results, as WellnessPRO™ sires. The top WT$ sires at Select are 7HO11741 MOCHA (+292), RENNIE (+222), POLICE (+188), KINGBOY (+179), ROOKIE (+177) and 7HO10920 GOLD CHIP (+177). Dairy Wellness Profit Index™ (DWP$™) is a multi-trait selection index which includes production, fertility, type, longevity and the wellness traits. Select leads the way with 26 of the breed’s top 50 DWP$ sires. RENNIE (+1,023), ROOKIE (+1,012) and YODER (+955) are the top three sires in the breed and are joined in the top 10 by SUPERSIRE (+919), TETRIS (+917), POLICE (+878), MOCHA (+870), BREWMASTER (+869) and 7HO11946 MIDNIGHT (+869). Select Sires is home to four sires over +3.00 PTAT: No. 1 sire 7HO11596 DEFIANT (+3.60), No. 4 7HO10506 G W ATWOOD (+3.44), No. 8 KINGBOY (+3.28) and No. 14 7HO11477 MCCUTCHEN (+3.13). 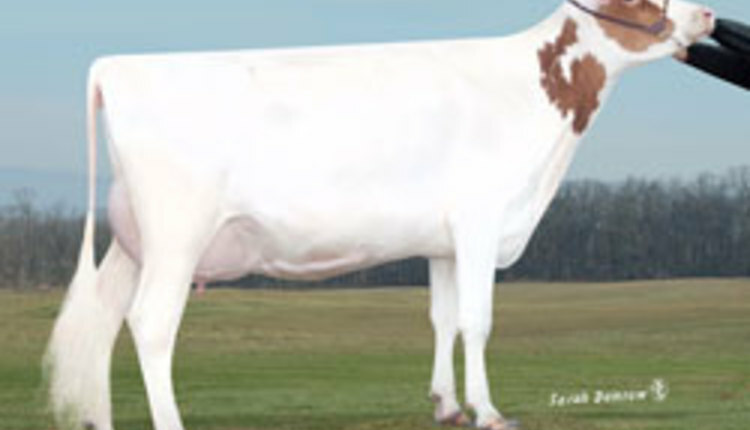 7HO11899 FURIOUS is the breed leader for Udder Composite (UDC) at +3.44 and MCCUTCHEN (+2.87), 7HO12139 PETY (+2.86), 7HO10999 BRADNICK (+2.73) and 7HO12222 KIAN (+2.70) rank in the top 20. 7HO11915 MULTIPLY (+2.76), 7HO12042 CORVETTE (+2.74), BRADNICK (+2.70), G W ATWOOD (+2.63), MCCUTCHEN (+2.48) and MOGUL (+2.42) are among the best for Feet and Leg Composite (FLC). Select Sires is home to 25 sires that are more than +6.0 for Productive Life (PL) including top-15 active A.I. sires MIDNIGHT (+8.1), MYSTIC (+7.8), 7HO10849 SHAMROCK (+7.8), 7HO12126 FLORES (+7.6) and MOCHA (+7.6). MYSTIC (+4.9), 7HO11893 ROZ-MAN (+4.4) and SHAMROCK (+4.3) are leaders for Livability (LIV) while FLORES (+6.2) and his sire 7HO11169 PETRONE (+5.8) are top-five active A.I. sires for DPR. 7HO11617 DIAMOND is the No. 3 sire for Somatic Cell Score (SCS) at 2.51. PETRONE (+5.0 Heifer Conception Rate) and FLORES (+8.1 Cow Conception Rate) are the No. 1 active A.I. sires for HCR and CCR, respectively. FLORES (+4.6), MOCHA (+4.5) and MIDNIGHT (+4.1) are top-10 HCR sires while PETRONE (+7.3), MOCHA (+6.7) and MYSTIC (+6.5) are among the best for CCR. Select Sires is the premier source for high fertility proven sires with an outstanding 49 proven that are +1.0 SCR or higher. Select’s fertility leaders include: newcomers 7HO12248 SUPERIOR (+4.1) and 7HO12115 DECEIVER (+3.8), DRAGONHEART (+3.6), YODER (+3.4), 7HO12095 MALLINGER (+3.1) and G W ATWOOD (+2.9).